Saturday July 20th 1895 I swept and cleaned the house up good this morning and fixed Olivers dinner to leave. We were invited to Robinsons and had such a pleasant day. Hattie was down there for dinner too. We came home and done the evening work. Oliver put out celery and cabbage today. 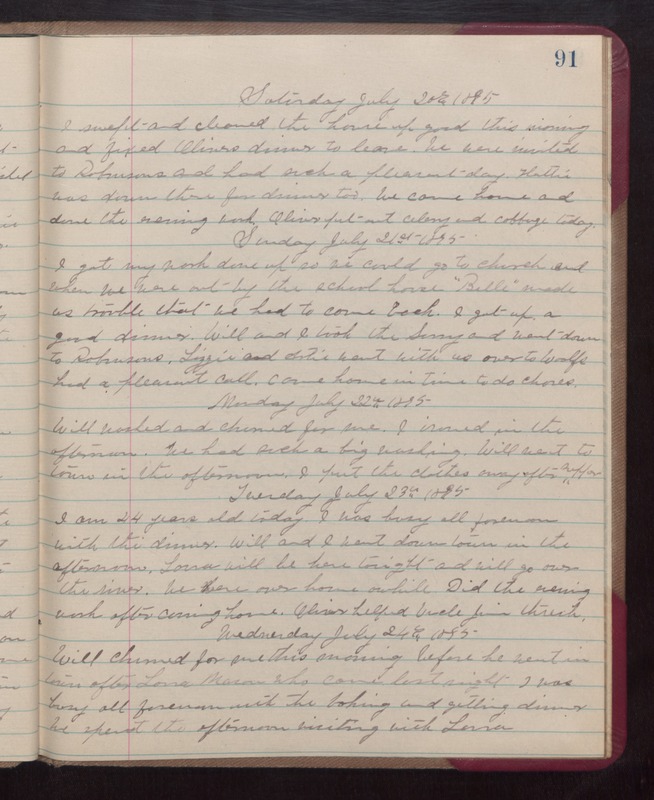 Sunday July 21st 1895 I got my work done up so we could go to church and when we were out by the school house "Belle" made us trouble that we had to come back. I got up a good dinner. Will and I took the Surrey and went down to Robinsons. Lizzie and Artie went with us over to Woolfs had a pleasant call. come home in time to do chores. Monday July 22nd 1895 I am 44 years old today. I was busy all forenoon with the dinner. Will and I went down town in the afternoon. Laura will be here tonight and will go over the river. We were over home awhile. Did the evening work after coming home. Oliver helped Uncle John thresh. Wednesday July 24th 1895 Will churned for me this morning before he went in town after Laura Mason who come last night. I was busy all forenoon with the baking and getting dinner. We spent the afternoon visiting with Laura.